Welcome to Open Door’s 2014 Annual Report. 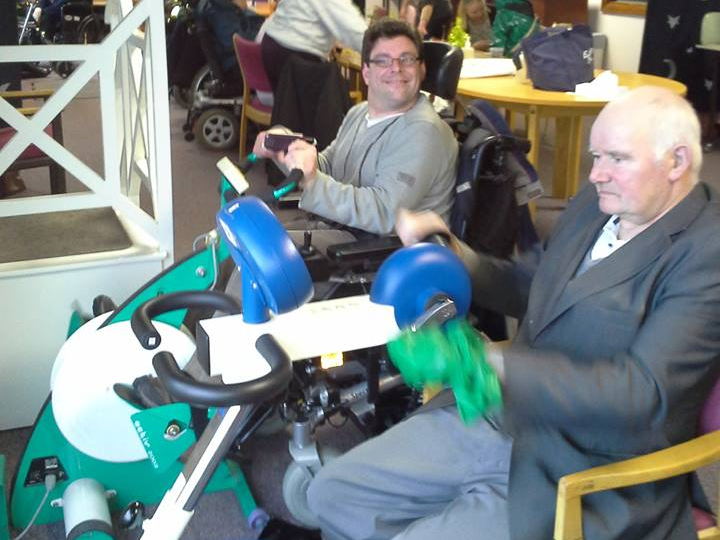 Thanks to your valued support, Open Door continues to provide activities for adults with physical & sensory disabilities while also offering support to carers and families. 2014 was a particularly special year as we proudly celebrated 30 years of caring in the community. Throughout this report you can see how your donations have impacted on members lives. 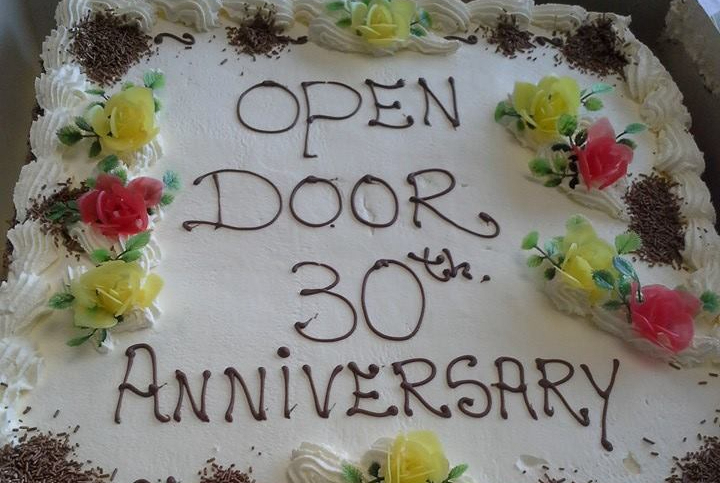 Please continue to remember Open Door and the valuable work that takes place in the Centre. We entered into our Anniversary year with strategies to provide the best care for our members while dealing with a downturn in funds due to negative publicity in the Charity sector. We continually endeavour to counteract any negativity through being open and transparent. Open Door is signed up to The Governance Code, is a member of Fundraising Ireland and of The Wheel. The increased number of applications for membership is strong indicator that there is a continued need for our services in the community. Our Care Manager, Rudy Montejo, works hard to accommodate as many members as possible with the resources available. Open Door is lucky to have dedicated staff and volunteers who are always on hand to assist members during the day. Many friendships are formed between members facing similar life challenges and this social aspect of Open Door is just as important as the activities themselves. Frances O'Sullivan, Open Door member coping with Parkinson's Disease, explains how Open Door helps her "My name is Frances O'Sullivan and I've been in Open Door for a little over 2 years. For me, it's an exceptional place because the camaraderie that you build up with the other members is very necessary to help keep your spirits up when you have difficult days, which everybody has, regardless of whether they're healthy or ill. So, I'd say to anybody that needs support, this is a very good place to find." Following on from our 'Making Sense with Cents' campaign, we took delivery of new branded Counter Top collection boxes. 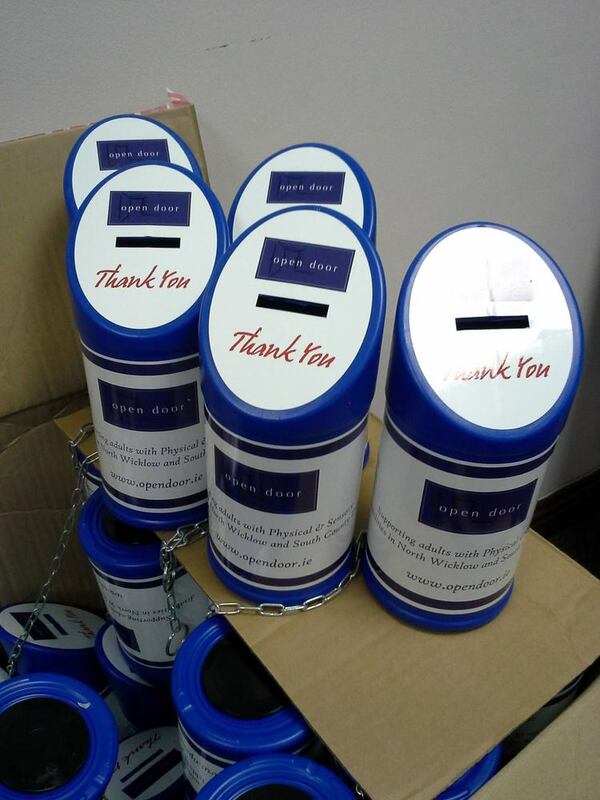 Many people in the community have kindly placed these boxes in their shops and businesses and helped raise funds for the Centre. To become involved click here. 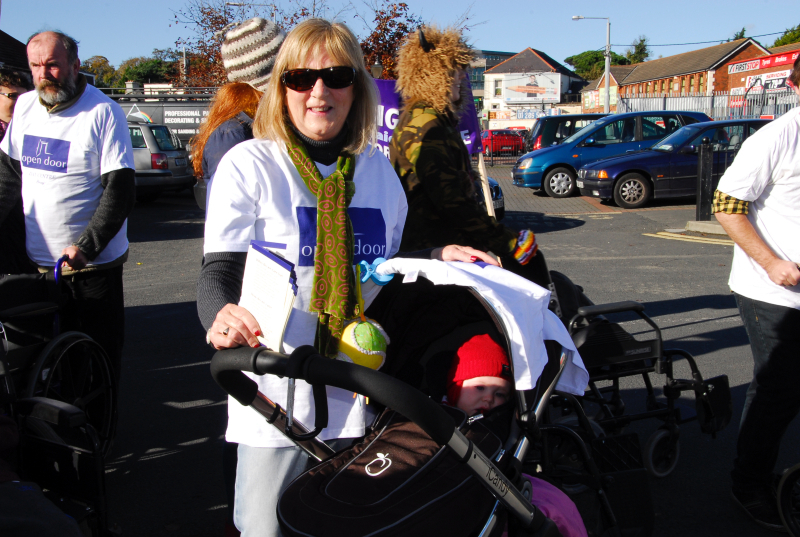 This year Open Door took part in the Bray and Greystones St Patrick’s Day Parades. The Woodwork and Art groups worked hard on our float which depicted various activities available to members. 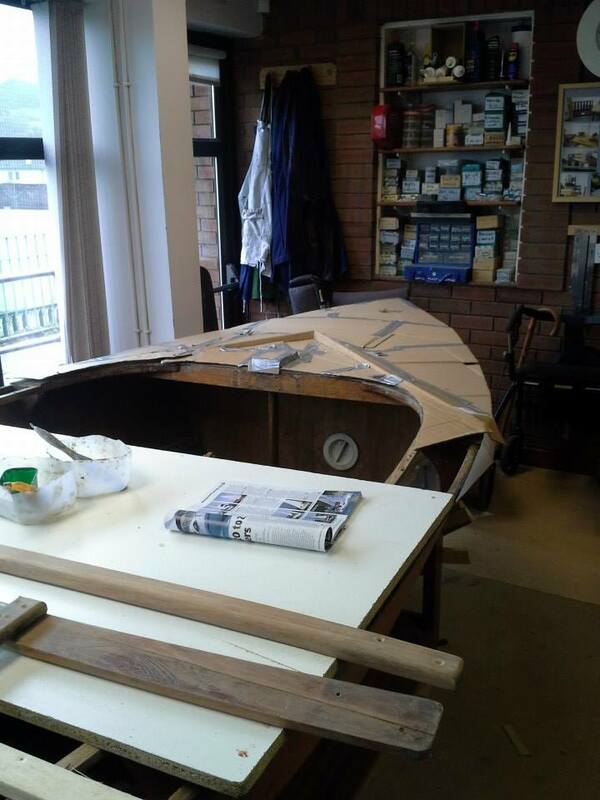 Sincere thanks to Brendan Byrne, Woodwork Tutor, for his hard work in putting the colourful float together. Delgany Dramatic Society held a charity night in conjunction with a costumed rehearsed reading of 'Hay Fever' by Noel Coward and split the proceeds between Open Door and St. Vincent de Paul. Sincere thanks to all involved. 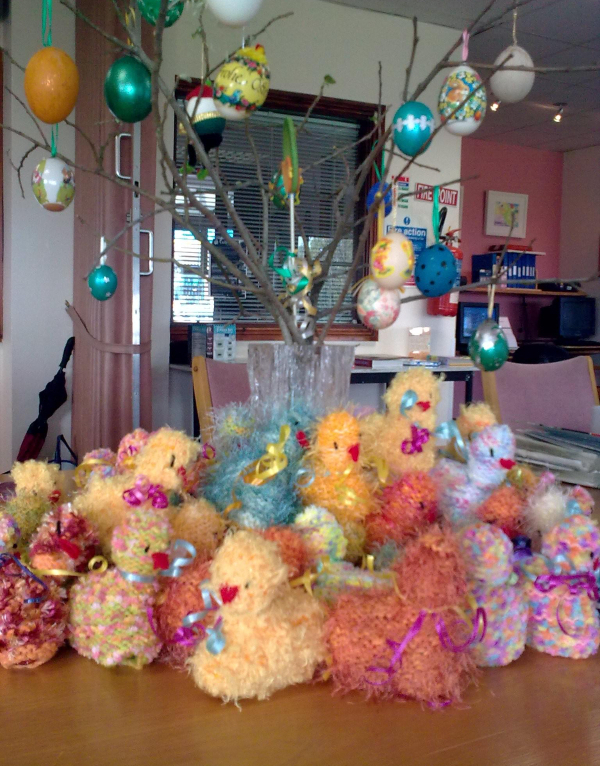 One of our youngest supporters made a most generous Easter donation to Open Door. During the months of May and June, Bray Recycling Centre and Open Door ran the 2nd annual 'Trash to Treasure' campaign. The value of all scrap metal and clothing collected in the Recycling Centre during this time was donated to Open Door and we are delighted to announce that €3,602.30 was raised through this environmentally friendly initiative. We would like to thank Bray Recycling Centre, Leon Recycling and Best Irish Used Clothing for their support. Not only do we need to raise funds for our programme of activities but but we must also find money to replace equipment in the Centre. This month we took delivery of a new MotoMed Physio Bike which compliments our existing range of Physiotherapy equipment. Lukasz Oleksiewicz, Physiotherapist, is already seeing the benefits to members using the MotoMed bike. 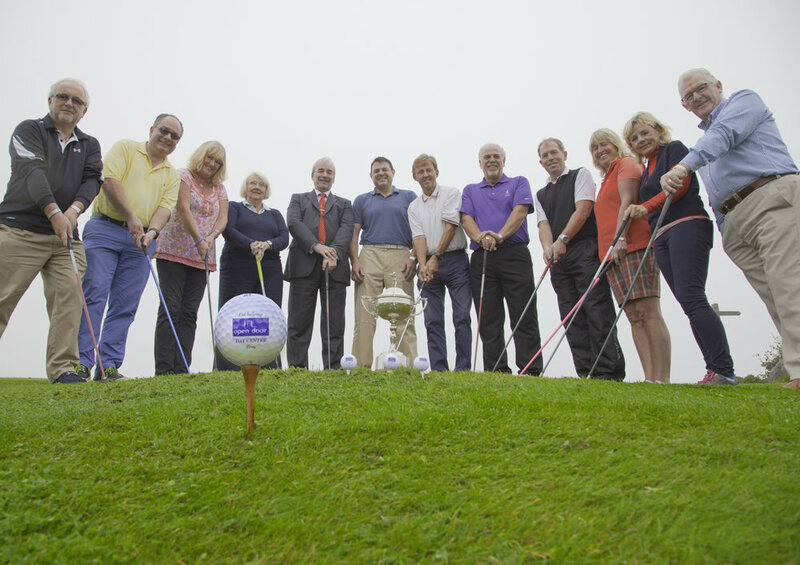 June is traditionally the busiest month for fundraising events in Open Door. The annual Mid-Summer Lunch is a very popular day with our friends and supporters. The day is a success largely due to the work of Chef John Tutty and Christopher Daly who kindly donate their time and expertise each year to produce a fantastic meal for 100 people. 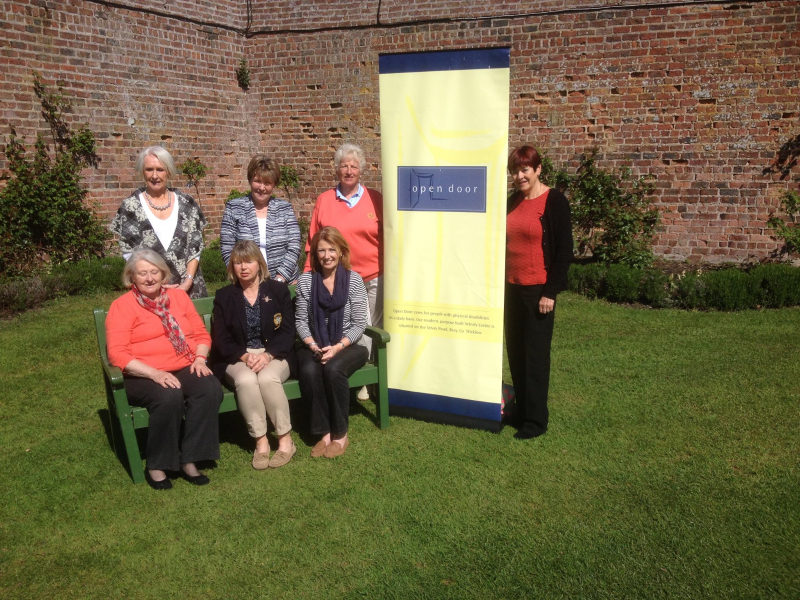 Greystones Golf Club, Lady Captain Margaret McGirr, organised a Fashion Show in aid of Open Door and raised an impressive €1,550.00. Well done to all involved. Furman Singers & Friends held a fundraising concert in St. Andrews Presbyterian Church, Bray, organised by Patrick Murphy. Mary Fogarty also performed on the night. The quality of the musicians was fantastic and we look forward to next year's concert featuring musicians from Cantebury High School, Indiana. 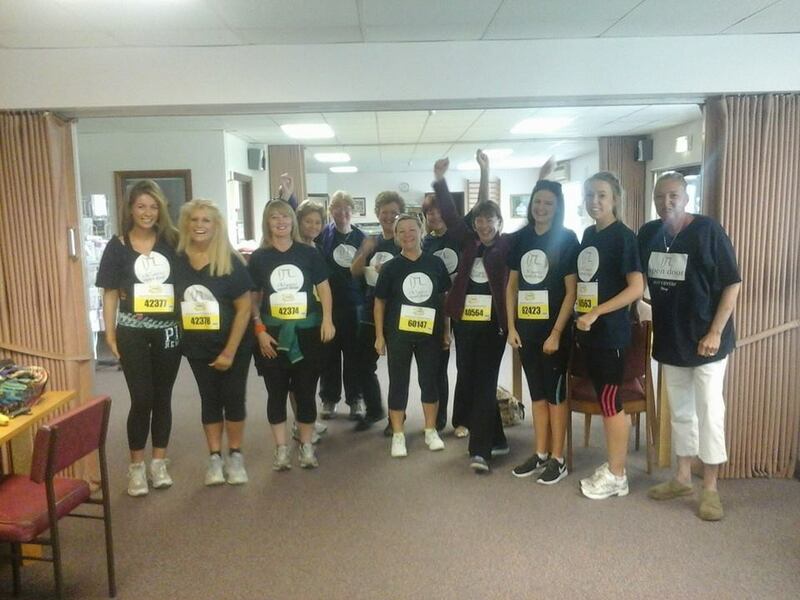 VHI Women's Mini Marathon (formerly known as the Flora Women’s Mini Marathon) - Female supporters put their best foot forward on Monday 2nd June in support of Open Door. Please consider joining us in 2015, on June 1st, to help adults with physical & sensory disabilities. Contact Suzanne on 01 286 7123 / 087 625 0823 or CLICK HERE to secure your sponsorship pack. Ladies Workout Express members and staff donated the amazing sum of €1,732.50 to Open Door Day Centre. Swap ‘til You Drop – Tommy Woodcock's wife & daughters raised € 358.00 from their Ladies Night, swapping clothes, shoes and handbags. Tommy has been a member for many years and his family have run a number of events including coffee mornings and table quizzes in the past. The 3rd annual wheelchair push 'The Big Push' took place in Bray on 12th July - This event symbolises the uphill struggle faced by so many of our members on a daily basis. Many thanks to all who took part in and donated to this enjoyable walk. 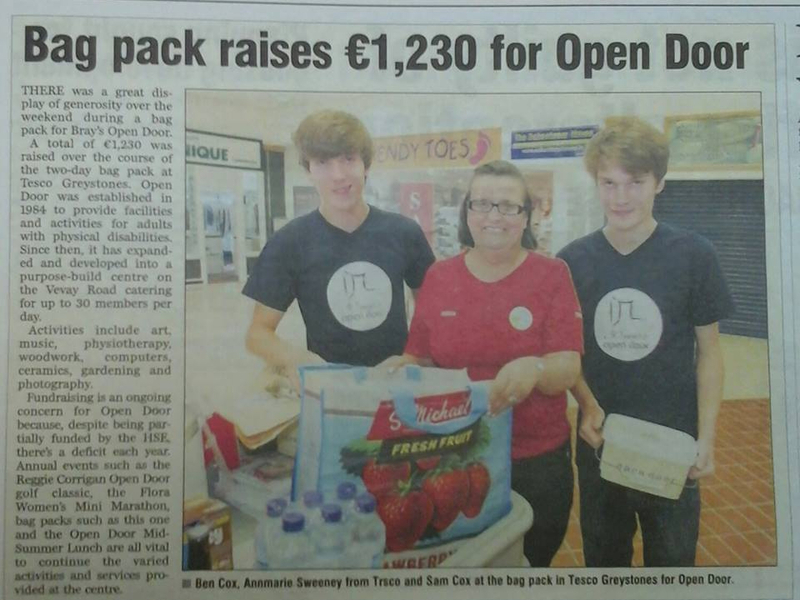 Tesco, Greystones kindly allocated a bag pack slot on 25th and 26th of July. We would like to thank our many volunteers for their help with this annual event. 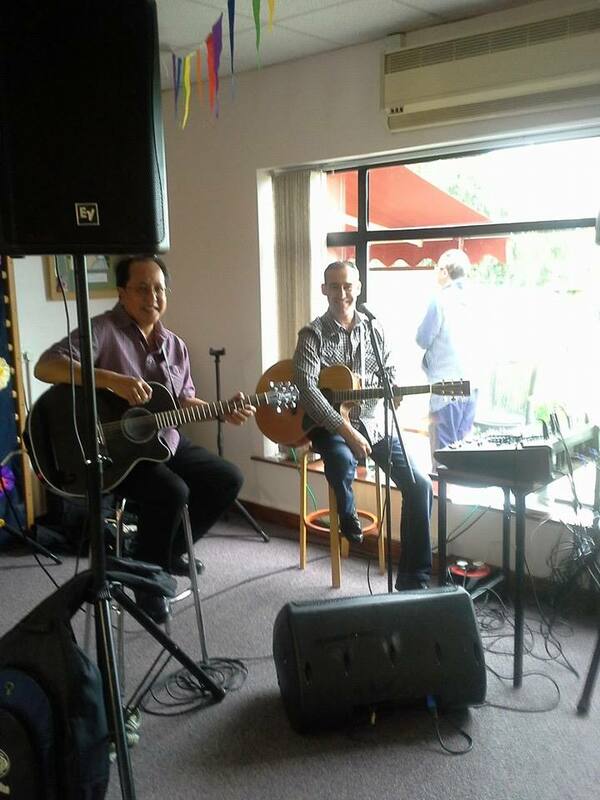 As part of our 30 Years celebrations, the Members 30th Anniversary Party took place on 29th August. Ann Dunbar's story (Employee at Open Door) - "I have worked in Open Door since 1987 when it was a small Centre based on the Boghall Road with approximately 12 members. There was great excitement in 1996 when we moved to this new purpose-built Centre. 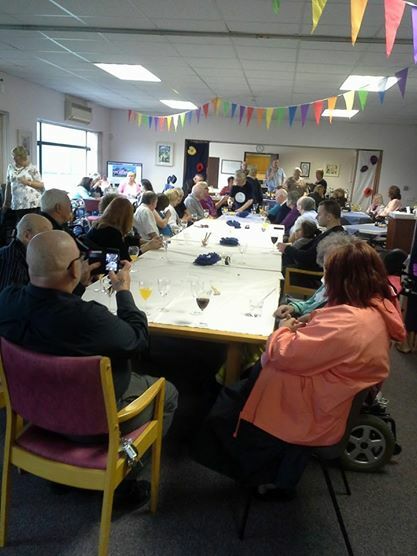 The additional space meant that we could now cater for additional members and numbers increased rapidly as there was a need for this type of service in the wider community. I am proud to be a part of such a positive place and have made a lot of good friends between staff, volunteers and members. I will be retiring in 2015 but I will not really be leaving Open Door, it is and always will be part of my life". On 27th September, Reg Byrne, Paralympic Powerlifter managed to lift an impressive 10,000 KG (10 tonne) over a 2 hour period in Open Door. His objective was to raise awareness of Paralympic Powerlifting while also raising funds for Open Door through the sale of branded wristbands, each representing 1 KG of the overall lift. 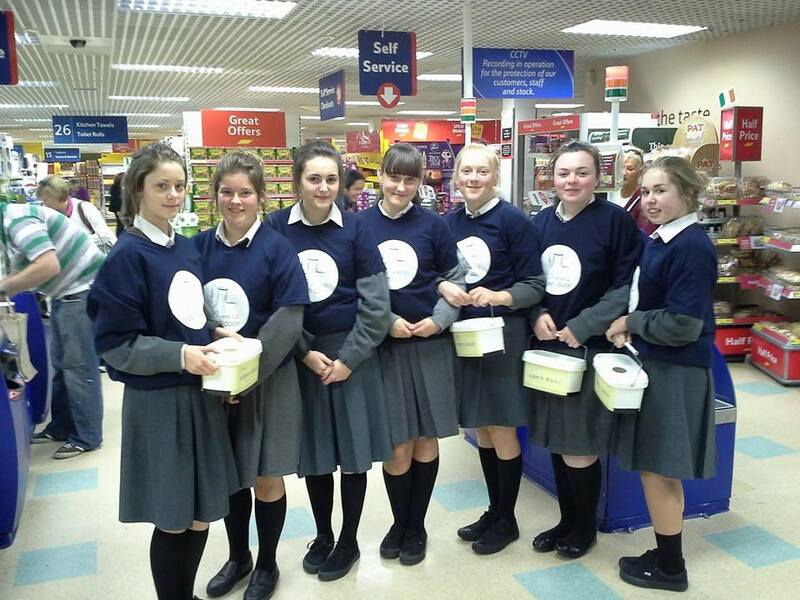 The annual Tesco Bray/ Loreto Bray Bag pack took place on 24th October. Also helping out on the day were UCD Business students as part of their Service Learning Project. We would like to thank everyone who donated to and helped with this annual bag pack. Open Door continues to develop it's on-line strategy with constant updates to our website, facebook and twitter accounts. Coughlan Web has been instrumental in increasing our on-line presence and making applications and enquiries easier for prospective members. 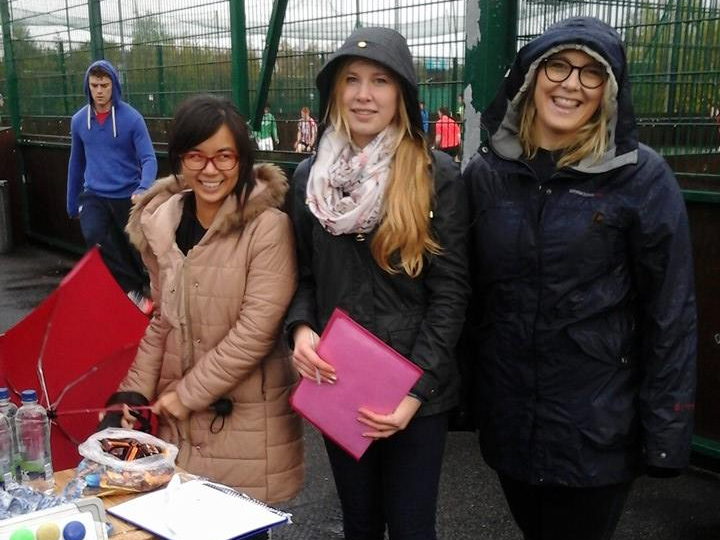 A group of UCD Business students, Brian, Dillon, Maria, Grace, Enda & On-jing organised a UCD Football Tournament to raise awareness of Open Door and also to raise money to go towards activities at the Centre. A total of 15 teams took part on the day and donated a total of €550.00. Eamhan Lawlor's (Family member and volunteer) story " I know about Open Door because my uncle Peter attends every Wednesday and Friday. Peter loves going to Open Door and never stops talking about what he has done. 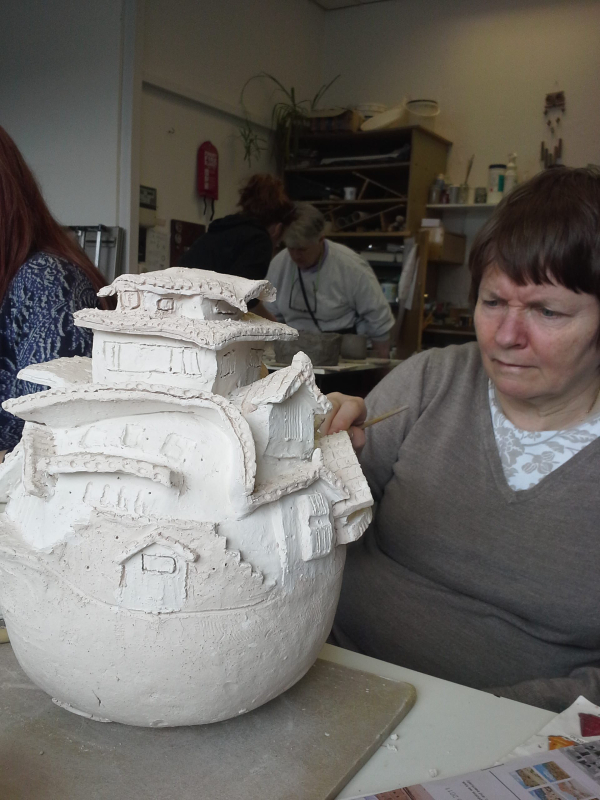 He loves the ceramics classes and has made lots of presents for me and my family. Over the years Peter has influenced me to be a better person. He is an inspiration and so is everyone in Open Door. In Open Door they teach you to be grateful for everything you have and not to judge people until you know their story. I chose Open Door as my work experience place because I was aware of the work they do and I had done some charity work for them in the past. I also wanted to see what life was like in Open Door on a daily basis. It was an honour to be allowed to do my work experience in Open Door and it's an experience I will never ever forget. 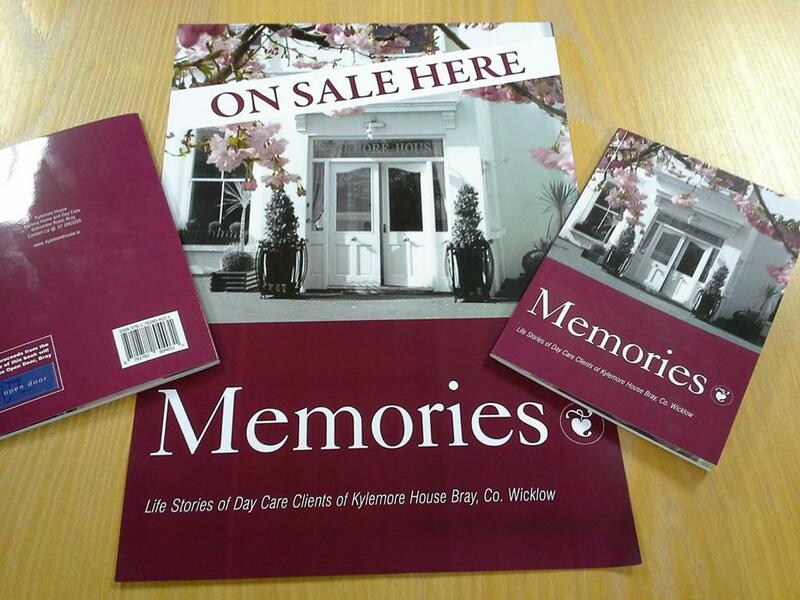 'Memories' a book of life stories of Day Care Clients of Kylemore House, Bray, Co. Wicklow was launched on 2nd December at the Bray Head Hotel. Ruth Behan, owner of Kylemore Nursing Home & Day Care Book came up with the idea to put together a book of memories and stories of people who attend Kylemore Day Care Centre and has generously donated all proceeds from book sales to Open Door. The book is available to purchase for €10 from Kylemore House, Open Door Day Centre, Hollands Lounge, Village Bookstore Greystones. Call in to collect your copy. Open Door would find it very difficult to survive without the invaluable help and assistance of our wonderful volunteers who are an integral part of the Open Door team. Thank you to each and every one of these fantastic people.